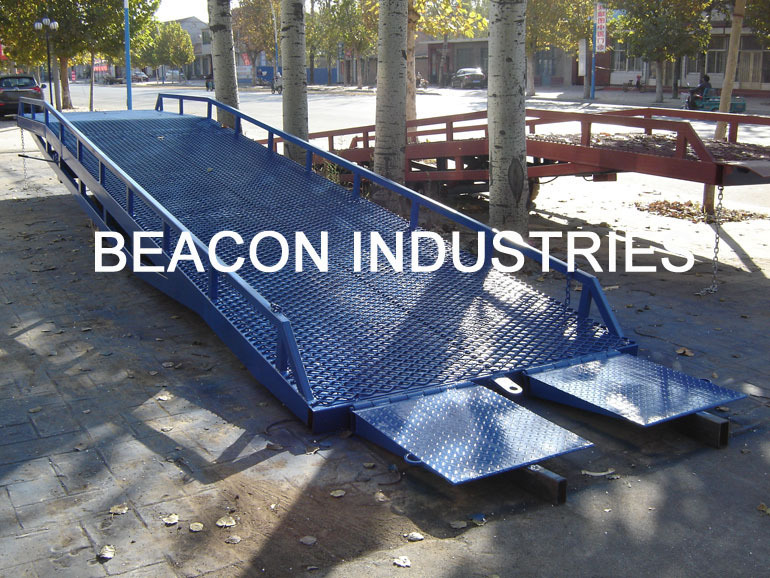 Mobile Hydraulic Loading Ramp is a special auxiliary equipment for loading and unloading of goods rapidly. Its height adjustment feature allows forklifts and other moving vehicles to enter into the truck directly and handle the goods. The dock ramp is mobile and controlled by manual hydraulic system, so only one person could operate it conveniently. It enables you to reduce the amount of labor and raise working efficiency. With handle pump, screw the return valve clockwise. Move the handle stick, to lift the ramp slowly. When the return valve is screwed counterclockwise, the hydraulic oil will go back, and the ramp will fall down on its own weight. Using artificial hydraulic power, don't must exteral electric power can be easily realized climbing height adjustment. Adjustable length of cable chains used to hook vehicles, make cllimbing and vehicles, even shift, always close together joint. Bridge body strength, high bearing capacity bridge by high strength manganese steel body skeleton into truss add structure: Compound high strength, the characteristics of large carrying capacity. Laying a layer above the bridge body slippery anilox steel plates. Mesh is distorted and hollow out, not only improved the reliability and work can prevent grease, dirt and ice accumulation. In addition to the relief valve, in order to prevent the tubing rupture, occur because of the accident, hydraulic systems of decline set in pipeline rupture types. The valve, when oil will automatically lock. 2. While the ramp falls down, the person climbing is forbidden.